Another innovation from Honda at the Tokyo Motor Show is its Micro Commuter Concept. 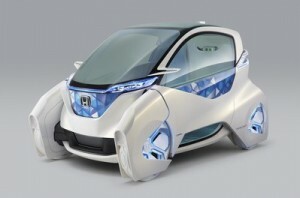 Unsurprisingly, the Micro Commuter Concept fulfils part of Honda’s vision for urban transport of the future. Acting as a bridge between Honda concepts designed for longer journeys, like the EV-STER and AC-X, and Honda’s futuristic town mobility concepts, the Micro Commuter is designed to be ‘worn like a jacket’, moulding to the drivers needs and tastes. The Honda Micro Commuter concept developed from Honda’s vision of Man MaxiMum, Machine MiniMum. What this means for the vehicle is that the electric powerhouse is located in the rear, and wheels are placed outside the main body, increasing room inside. This offers room for three people within a very compact space. However, at only 2.5 metres long, it seems possible that the Micro Commuter might be hit with the same problems as Nissan’s PIVO 3 in making it to production. To comply with international safety legislation, the design may have to be enlarged. Top speed on the Honda Micro Commuter is approximately 37 mph, with a driving range of around 35 miles on a single charge, making it a perfect urban run-about. Honda’s new LOOP battery concept plays a part in the Micro Commuter’s design. Easy to charge at home, the LOOP battery becomes an additional power source in the car. It can power the air conditioning or audio system, being recharged with regenerated power as the Micro Commuter is driven around town. The LOOP battery can also be removed to power either a laptop computer or one of Honda’s micro mobility concepts. The Honda Micro Commuter is also designed to integrate with Honda’s Smart Home System, a solution for generating electricity at a domestic level. Solar panels produce electricity, which can be used for the home or to charge electric cars. There is also the possibility to produce electrolyzed water and hydrogen fuel, in line with Honda’s commitment to developing hydrogen fuel-cell vehicles. The Smart Home System is ready to move into the testing stage in 2012, raising the possibility of radically changing how we generate electricity and power our vehicles. The Honda Micro Commuter enables the driver to connect their smartphone to the car’s technology, immediately bringing up information that matches their interests. And, like a smartphone, the Micro Commuter is customisable. The exterior can be endlessly changed and adapted by inserted graphic sheets into the body’s panels. Honda are aiming for a friendly, approachable look and simple, functional beauty. The bubble-like windscreen and windows and ergonomic-looking clean interior certainly meet this. Nevertheless, there is something slightly awkward about the semi-enclosed wheels. Keep yourself updated with the latest from the Tokyo Motor Show by liking us on facebook, following us on twitter or connecting with us on LinkedIn. If you’re interested in buying or leasing a new vehicle contact our sales team. Alternatively, visit our website where you will find new and used Honda’s available for sale or on finance.